A Grave Keeper that buries rivals alive, a Torturer that slams foes in his Iron Maiden, a dutiful bounty hunter Executioner, a morbid Conjurer (complete with severed Saint head and rotting undead cat), and other characters fight to the death. 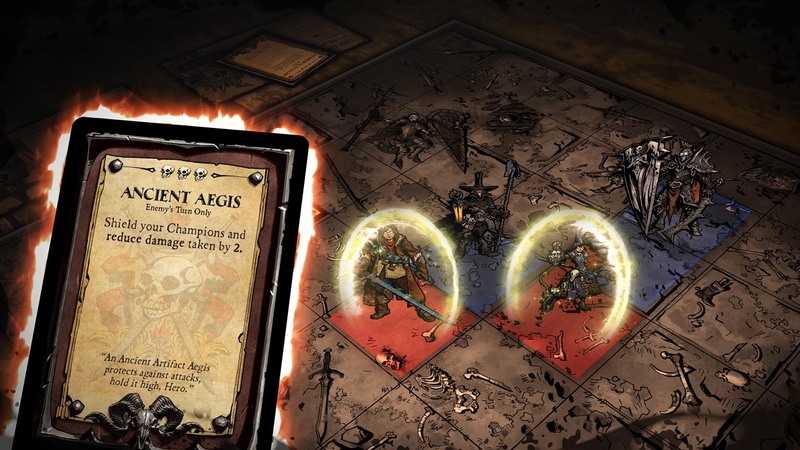 Randomly drawn relic cards and selected Artifact cards add to the strategic insanity by combining with character attacks. Oh and there are also environmental hazards, so if you’re into launching people from a catapult into spikes, you-do-you. It is natural as design owner to guide artist on the vision. Are you in any ways artistic yourself? I’m a teensy-bit artistic. Good enough to help communicate a point, but not good enough to ever show anyone my art. The way I work with artists is to help describe characters/environments/histories in detail so they can create some interesting stories with their art. 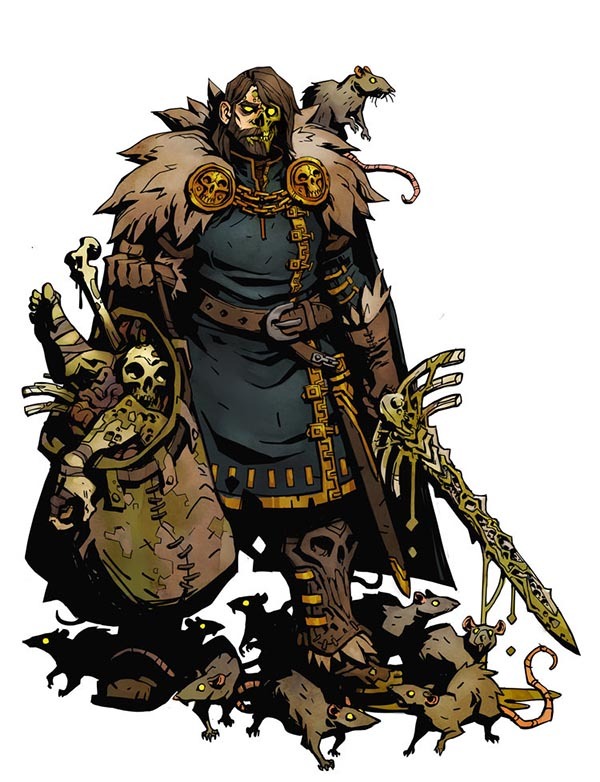 As an example, the Plague Baron is a warrior that survived a horrific plague due to his extensive Saint Artifact collection. The rest of his city state though, succumbed to the flesh eating pox. 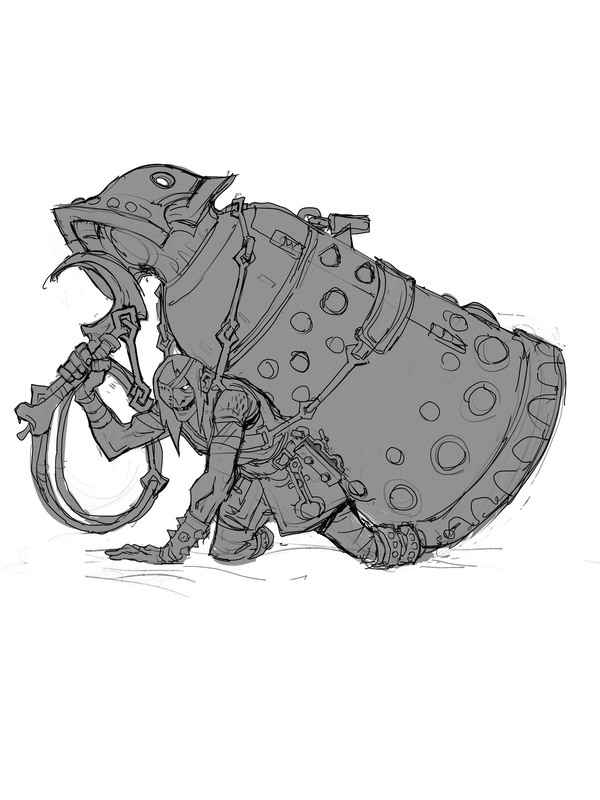 When we were creating this guy, he had attacks that unleashed trained rats (the only living creatures that survived) that would swarm opponents and make them vomit uncontrollably. This meant we HAD to have tons of rats scurrying around him. I don’t tell the artist what to draw, I just give tons of details, and some details they’ll add in the art to help tell that story. It’s pretty collaborative but there is certainly a vision. 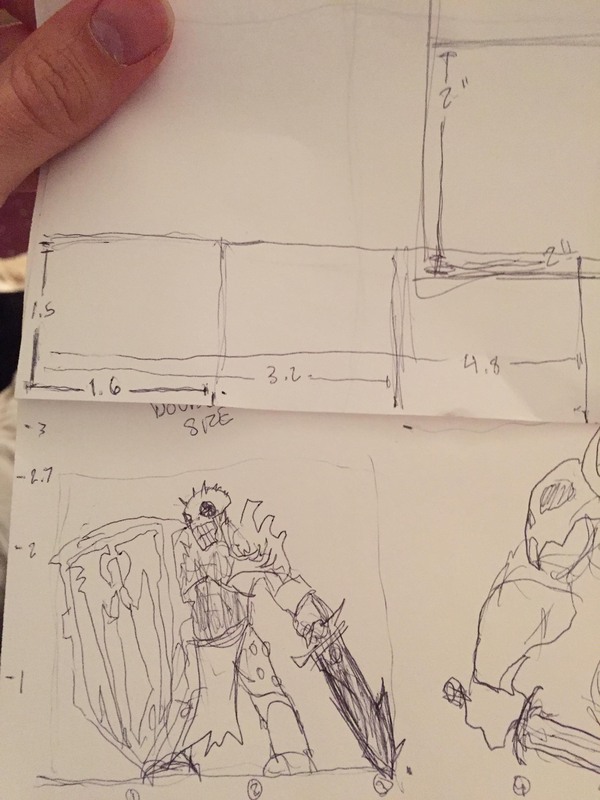 How did you make your first prototype art and how did it look. 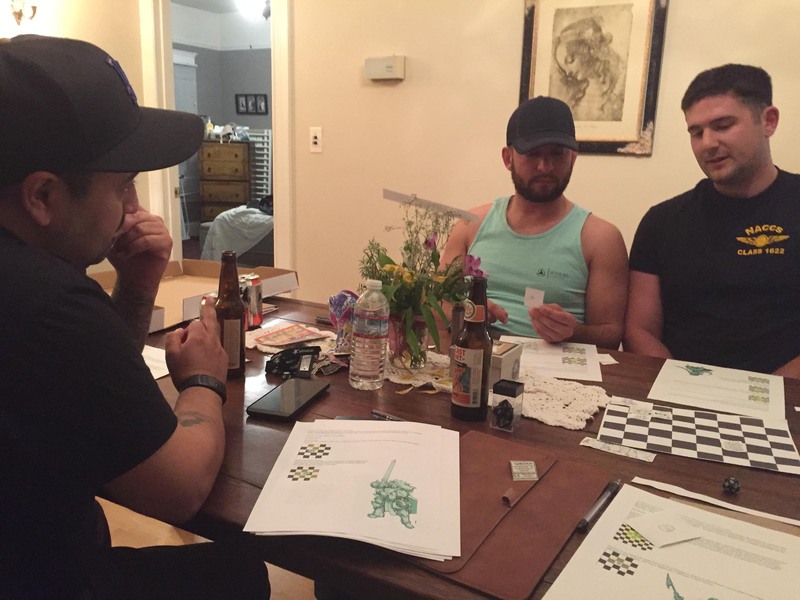 What is good and bad about the way you made you prototype art? 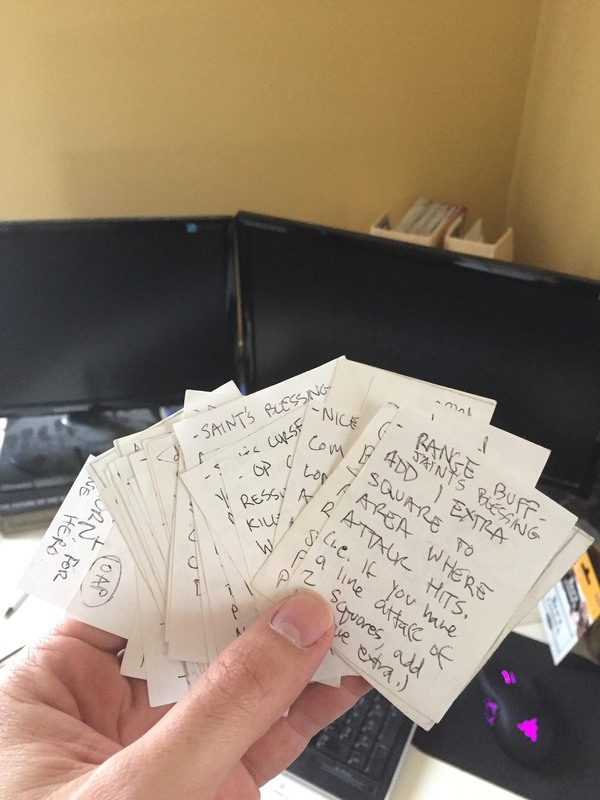 The first version of the game was all hand written and drawn by me quickly. The point was not to spend hours agonizing over the art, but to give the player an idea of what they were playing with. The art usually got a laugh with how simplistic it was, but it worked. When did you involve Kory, Mathew and Jessica for illustration and design and how did you find them? I worked with all of them at some point or another. Kory and I worked on Wildstar, Matt and I worked on WoW, and Jess worked for NCSOFT, the publisher for Wildstar. I got them involved after I felt the mechanics in the game were solid enough that they wouldn’t change significantly. (Games always evolve, but after a few shifts in the design, I felt good with where it was at.) This was probably about a year into design before I got them involved. How did the Brutality universe come to look as it is. Kory and I are comic book nerds and we wanted to have an aesthetic that felt like you were reading a mix between Hellboy and Battlechasers. The characters were over the top and there is a bit of humor/personality thrown in the game, so the characters needed to reflect that idea. 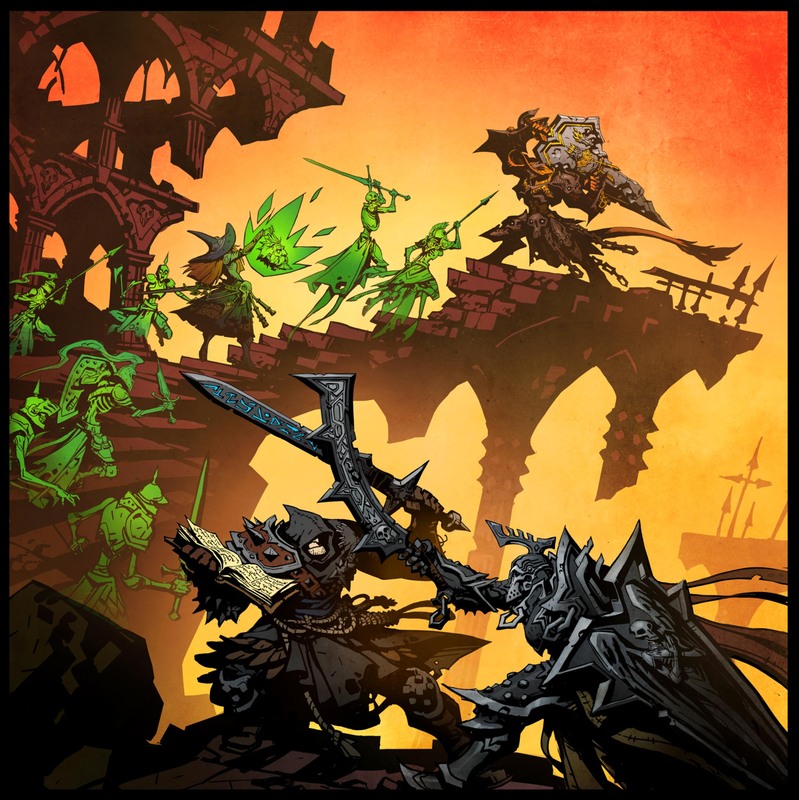 I love artists like Adrian Smith and Frank Frazetta, but we didn’t want a seriously heavy looking art style because it wouldn’t have matched the tone of a game like Brutality. Ahh yes, I can see the Mike Mignola inspiration in the lines. How did you brief the artist and designers? I told him about the characters. I gave elevator pitches about each of them. 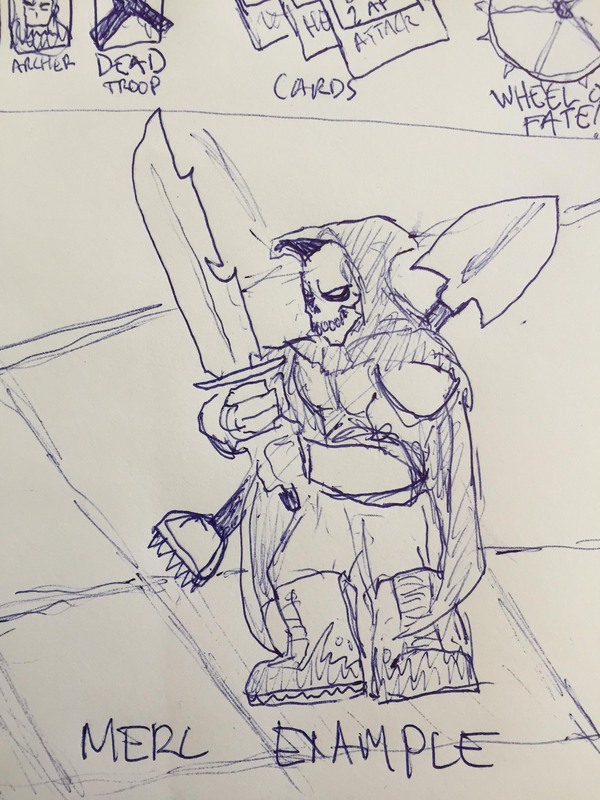 “The Grave Keeper is a solemn knight who keeps the dead buried and buries anyone alive that tries to steal relics from the dead in their crypts. He guards Corsul, a cemetary city that is nothing but cathedrals, tombs, crypts, and mausoleums.” Then I’d go into personality descriptions, things they’ve done in their pasts that have shaped their personalities, and their physical descriptions. Anything that surprised you about the art creation? Kory is a great artistic story-teller. 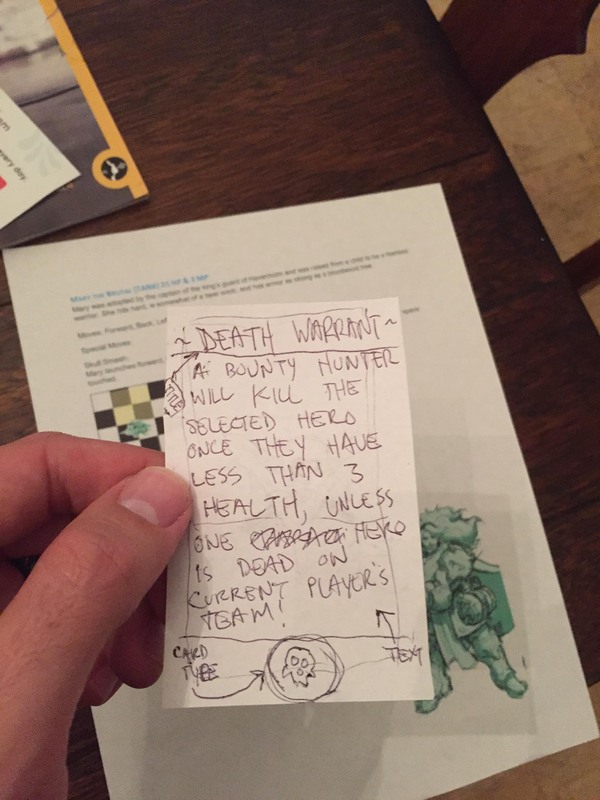 He’d pitch and draw ideas that helped convey ideas to players without them reading a single piece of text about the character. What surprised me was Kory’s ability to take an idea and make it crazier. What can go wrong and how to avoid it? Make sure artists send early renders to the game designer so they can offer suggestions when the art is in a rough state. It’s a ton more painful to make changes when renders are close to done, so try to get feedback early. Also, if you’re a Creative Director or Designer, try to focus on the things that will inspire the artist and give them fodder to make cool art decisions. I also rarely critique technique, as they know more than I do about art. I just focus on the direction and trying to focus on what makes that character unique or interesting. 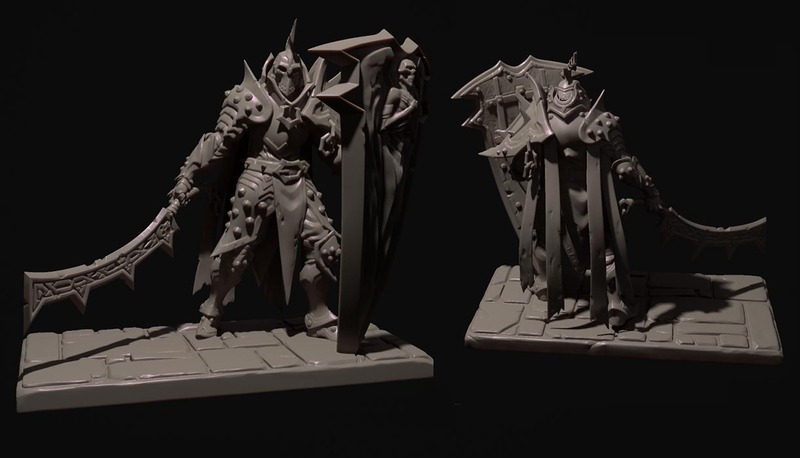 Brutality got a brilliant selection of minis created by an array of 3d sculptors. Why so many different artists and how did you find them? The more artists you have, the more figures you can get done at once. If I get one 3D artist, and it takes him 1-2 months to make a figure, that means I’ll get 11 figures done in 22 months, worst case scenario. That’s too long. But if you have 11 artists working on the figures at once, that’s 11 figures in 2 months. I knew the artists personally through various jobs. 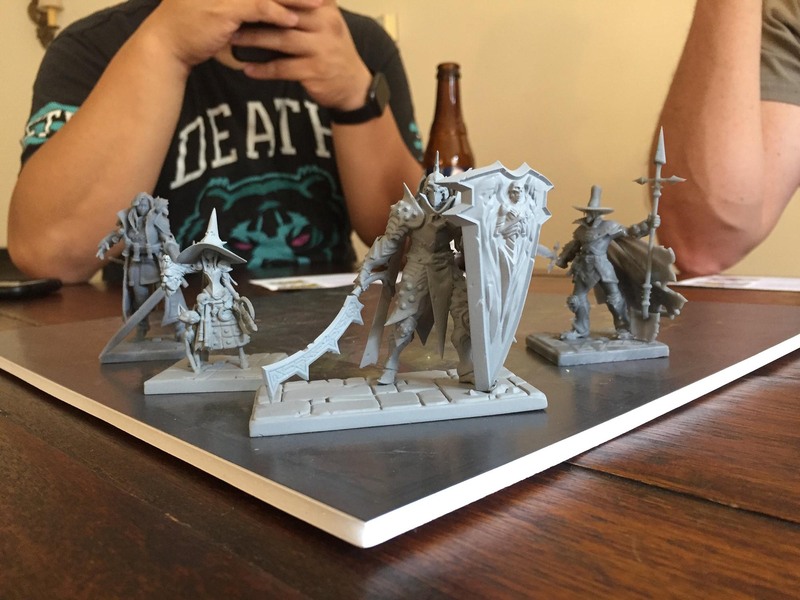 I showed them the concept art, had em play the game, and they were interested. Can you tell us about the way you work with sculptors? Similarly with the 2D artists, I give them the personality and story. 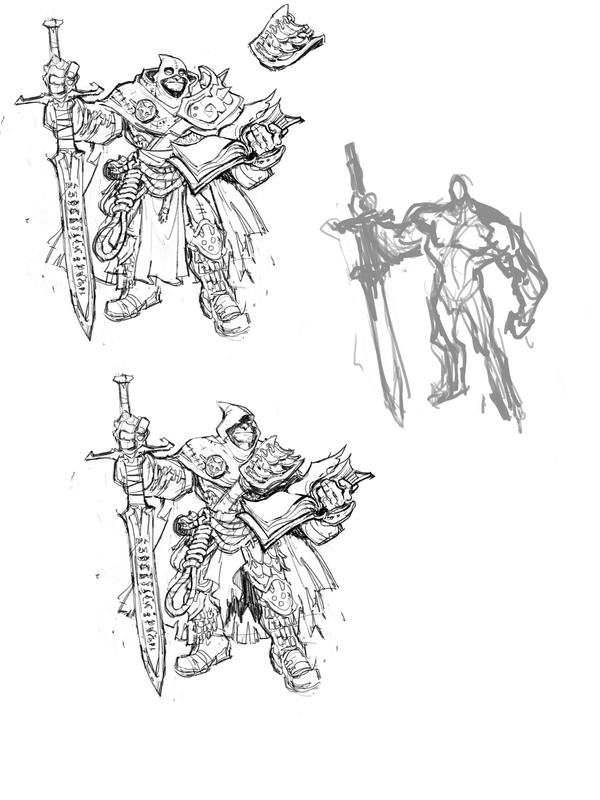 It’s a bit different in that a lot of that has been figured out with the 2D artist (Kory), but the poses and stature are a big part of selling that. 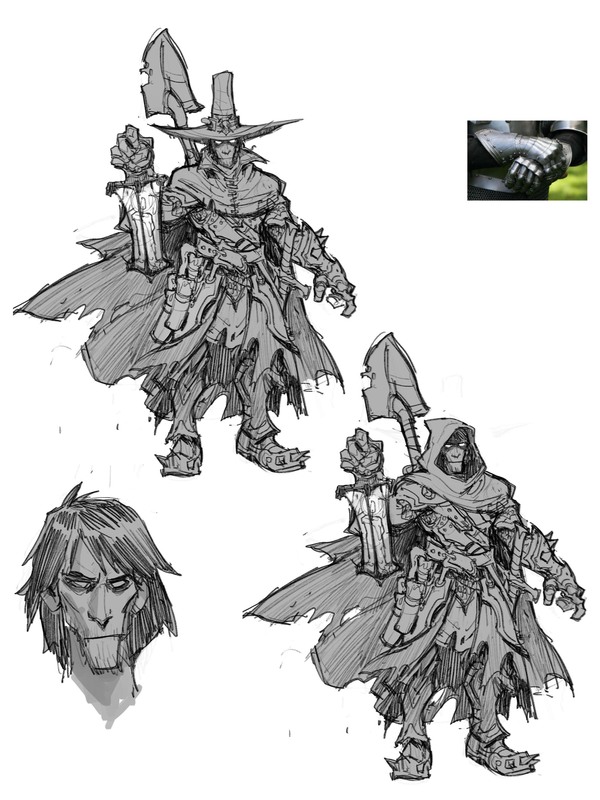 Kory does the actual art direction though, and he focuses on shape language and style of the characters. We’ll do paintovers and turnarounds to help the artists get an understanding of what these characters look like in a 3D space. Is the tips you would pass on to other designers going down this road? Focus on the fantasy and the style you are trying to sell, and really push those ideas. The Conjurer for example is, at her core, a witch. What cool things do witches do? Resurrect dead animals, cast spells, use wands, talk with the dead/spirits, etc. Then in a medieval style, what can we add that makes it intriguing in that world? What if she had a sword that is also a wand? (That was a Kory idea that took the core fantasy and made it stronger.) That sort of thing. How do you make sure the models live up to production specification and requirements? Ensure that we set examples from other games and try to hit that level of quality, or hopefully, improve upon it. 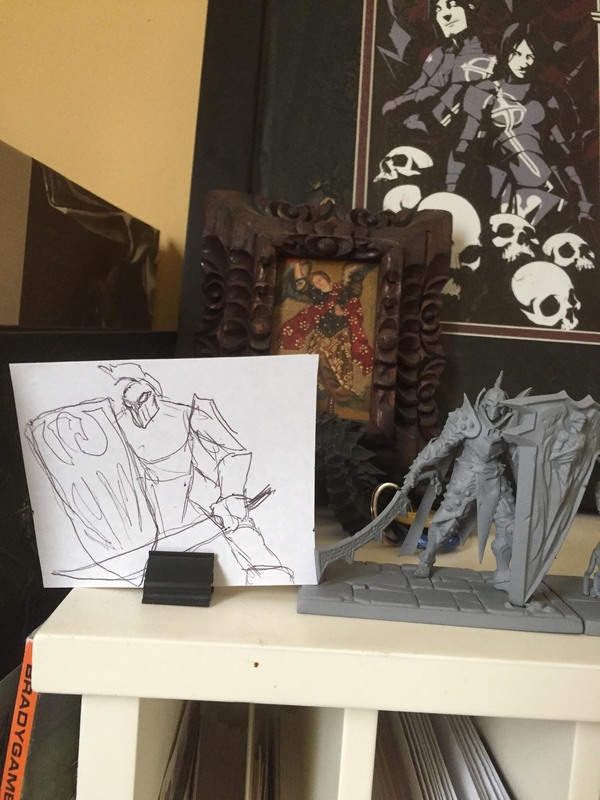 3D models for games vs. figures are also different, so we can’t have the minute details you have in games without simplifying them, so we try to have the artists keep that in mind as well. It must be a lot of work to keep so many artists on track? Yep. On top of designing the game. On top of playtesting and iterating. On top of talking with the manufacturer. On top of making a Kickstarter. On top of making/maintaining a website. On top of making videos about the game. On top of responding to emails and Kickstarter messages/requests/concerns. I work a full time job during the day, see my family for a few hours, then work until 1:30 am on the board game. Anyone can do this stuff, but if you aren’t motivated to finish or work on a passion project, don’t even bother starting. I tend to keep track of stuff in Excel and Trello. This way I can see what’s in progress, what has yet to be done, and what’s actually done. Now you are funded – how do you see the road ahead? We need to finish the 3D models, then we’re working with the manufacturer to get this game in people’s hands as quickly as possible. After that, I’m onto making more figures, relics, and artifacts for the game for an expansion. 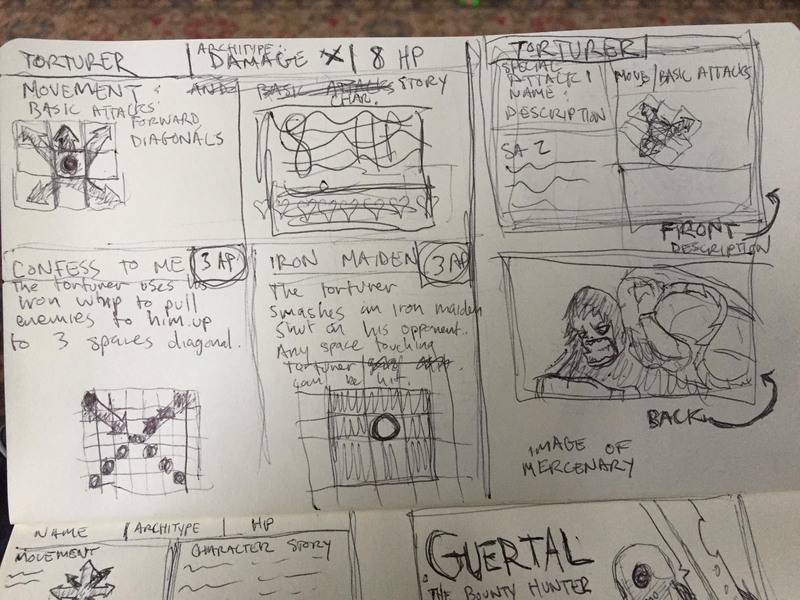 After THAT, I’ll start working in earnest on a follow up game that will still allow players to use all the characters they have purchased, but in a new format and ruleset. If I don’t go into an exhaustion coma before that, anyway. We hope you do not – Thank you for telling the story of Brutality. Readers can read more about the game here.